Kind of like that special deal on the Ronco Electric Food Dehydrator that’s only available for the next 30 minutes, or the McRib sandwich, there are certain things in life that you need to take advantage of while they’re still around. 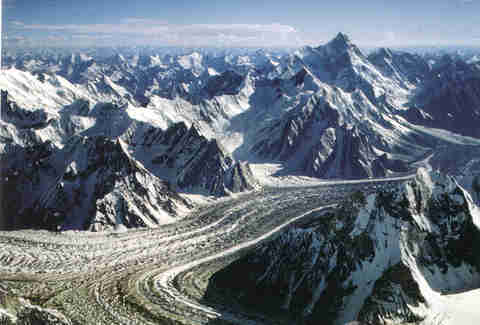 And glaciers, regardless of your thoughts as to why they are disappearing, are definitely on that list. 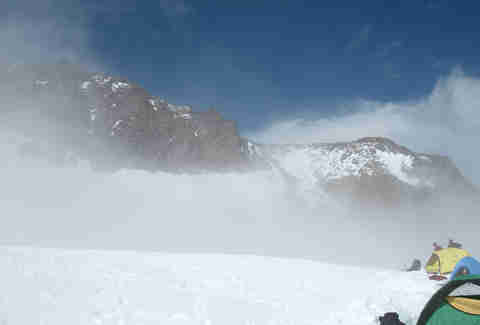 The good news, though: you don’t need to be an expert climber to hike a glacier. You just need a pair of decent Rockports. 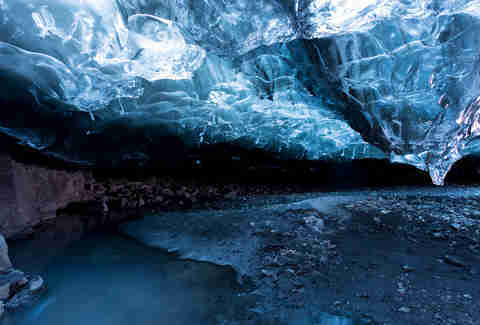 And this list of the 12 best glacier hikes you should do before they melt into the ocean and put Miami under water. Just because this is one of the few glaciers in the world that you hike above and look down on, don't think you’re even close to being better than it is. The 14-mile, 900m-deep field of ice (the longest in the Alps) weighs an estimated 27 billion tons and looks almost like a giant frozen freeway running through the middle of the mountains. Fortunately, the Swiss aren’t as big on terrible reality TV as we are, and Ice Road Truckers: Switzerland isn’t slated for production any time soon. For the novice glacier hiker who, for whatever reason, has decided to travel all the way to Iceland for an easy hike, your best bet is Solheimajokull. On this relatively low-impact trail, you'll spend a few hours moseying through ice sculptures, water cauldrons, and rock formations caused by the glacier’s movement over millions of years. It doesn’t take much skill or any specialized equipment, nor does it involve challenging an active volcano like some other Icelandic hikes. Sure, Pakistan may not top the 2015 list of safe tourism destinations, but if you’re willing to ignore the political issues, then this hike might be the best thing you can do in the entire country. The 100-plus-mile trek can take 10-12 days and will bring you right up to the base of K2, where a 37m river of ice flows through the base of the Himalayas. 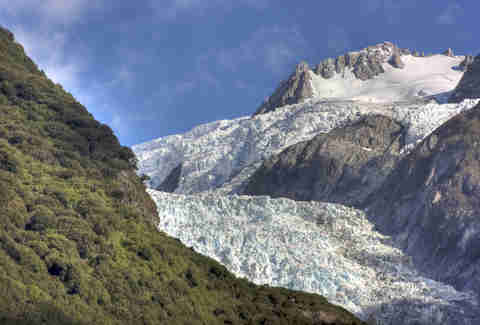 This glacier on New Zealand’s west coast is, like, the most hipster glacier in the world: while the other glaciers think it’s cool to start melting and getting smaller, this one is actually doing the opposite and listening to vinyl records... sorry, it's growing. It’s also only 7.5 miles from the Tasman Sea and cozies right up near tropical forests. In fact, it's one of the few places in the world where you can experience tropical fauna while staring at ice caps overhead. If you’re into hiking glaciers, you’re probably not one whose idea of a challenging workout is ramping it up to level 12 on the elliptical machine. But there’s extreme, and then there’s hiking a glacier that’s atop an extremely active volcano. 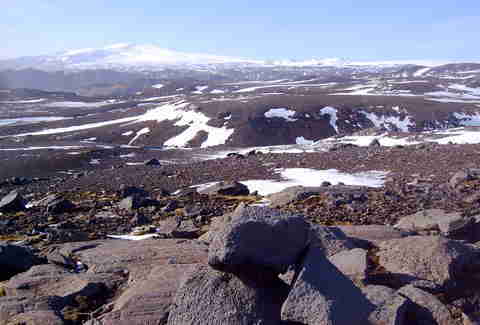 That would be Grímsvötn, which has erupted three times since 1996. If you’re willing to take that risk, Europe’s biggest glacier boasts both underground hot springs and spectacular views of the Northern Lights. If you took our advice and hit Lake Louise for your honeymoon, then hopefully somebody told you to head south to Jasper to the most visited glacier in North America, which spans 15 miles across the Continental Divide. 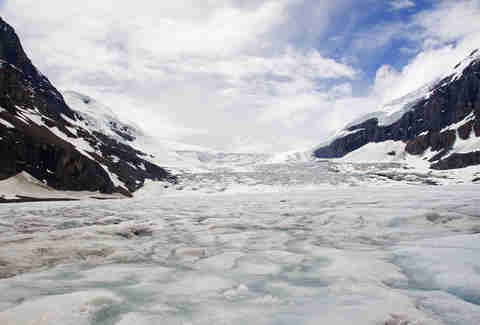 The most popular hike is along the almost four-mile Athabasca, a slow-moving river of ice that runs through a mountain valley right up to the Icefields Parkway. While observing Alaskan glaciers from the comfort of the lido deck might be fine for some people, if you prefer your glaciers without a side of overweight tourist, then the best way to see them is hiking through Glacier Bay National Park. 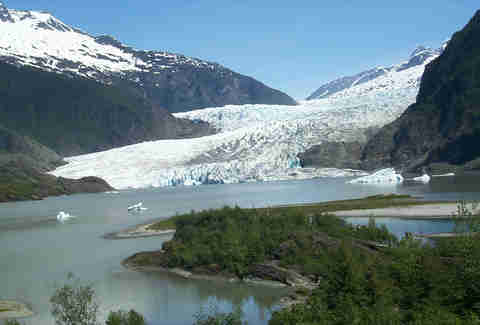 The most popular among these hikes is Mendenhall, which offers five trails (none of which is longer than about seven miles) and a ton of varying vantage points to appreciate this 12-mile ice mass. It’s also just a short drive from Juneau, so pretty easily accessible by car. 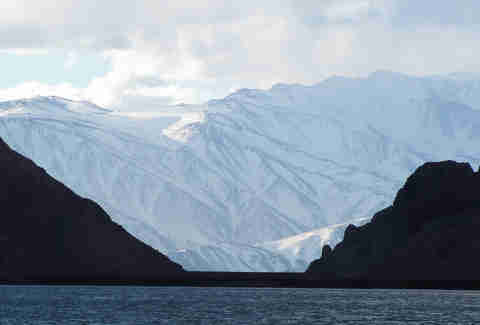 Possibly the most diverse and interesting hike on the list, it includes both underground lagoons and a trek up to an above-ground lagoon that's spectacularly placed at the foot of the massive glacier. And if you wanna try to summit Laguna, you'll pass through abandoned mines while enjoying panoramic views of the lakes and surrounding mountains Illampu and Jancohuma. There's nothing like a nice, peaceful hike through snow-filled forests, with nothing but the silence of the Patagonian Continental Ice Field to accompany you until... BOOM! 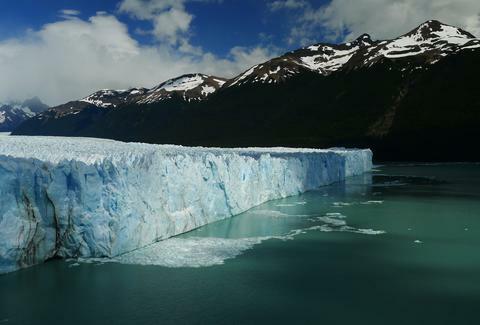 No, La Revolución hasn’t returned to Argentina, that’s just a giant chunk of the glacier breaking off into Lake Argentino, and it's more or less the only sound you’ll hear as you hike over one of the world's largest supplies of drinking water. Sadly, though, no unbelievably cheap steak dinners are served on the glacier. 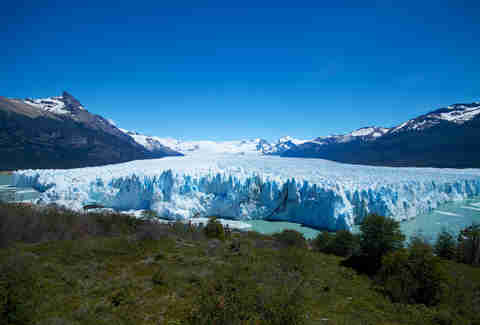 Unfortunately, when you finish climbing this glacier you can’t just hop next door for a quick screening of Captain EO. The upside, though: no three-hour line. 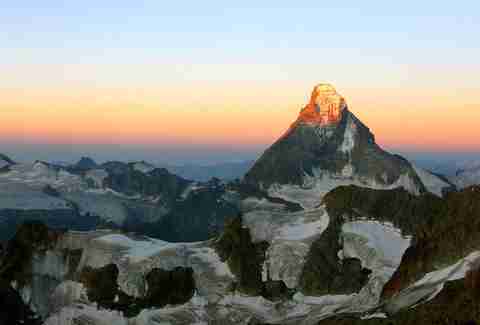 Switzerland’s most famous mountain (and, of course, the inspiration for the famous Disney coaster) formed when the land mass of Africa began moving towards Europe about 50 million years ago. Today it looks like a giant scraggly tooth sticking up from the mountains and is a bucket-list climb for any self-respecting mountain climber. The most popular ascent is Hörnligrat, one of the most difficult and beautiful climbs of Europe’s 13,000ft summits. 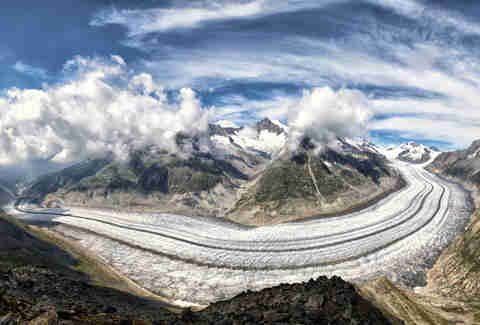 Since it sits in one of America’s most popular national parks, this may be the most-traveled glacier trail on the list. And while summiting Rainier is typically reserved for experienced mountain climbers, you can still hike the glaciers you see behind the Seattle skyline on the Muir Trail. You'll get as high as Camp Muir without a climbing permit, but that should still give you a pretty amazing front-row seat to the glaciers, seracs, and crevices. Picking the best glacier hike in a park actually called glacier is pretty tough, but you can get first-rate views of many of the park's ice blocks on this hike through the Many Glacier area. It offers the best views of Mt. Grinnell, Mt. 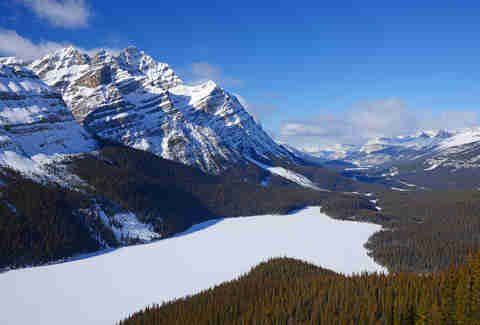 Wilbur, and Swiftcurrent Mountain, and takes you to the best view of Ptarmigan Falls before arriving at Iceberg Lake. And as the name might imply, it’s completely filled with the best lettuce used at the Sizzler salad bar.